At first, it was nice to see the water levels at the lake returning to normal. 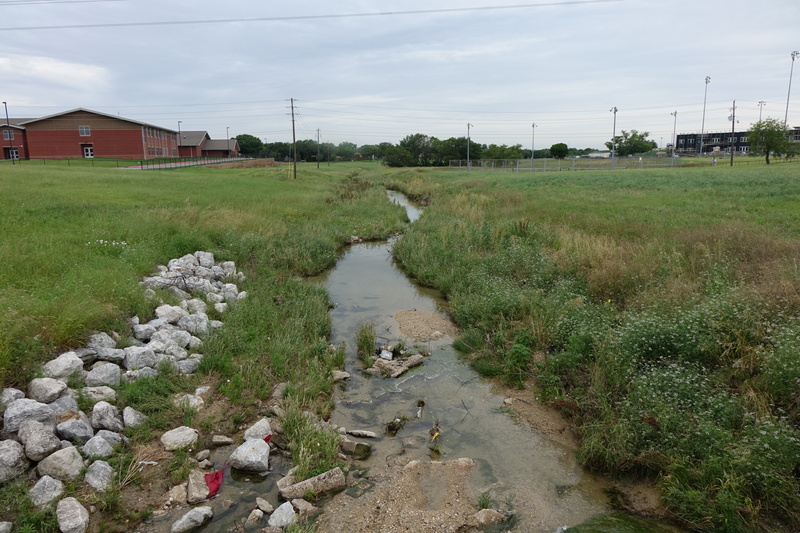 Then, more good news as reservoirs in water districts around North Texas swelled, loosening usage restrictions for residents as a years-long drought came to an end. But the rain hasn’t stopped. The spring of 2015 has brought flash flooding and severe weather warnings throughout the region, reminiscent of the floods from 2007. As a lakeside community, the City of The Colony has been particularly impacted. 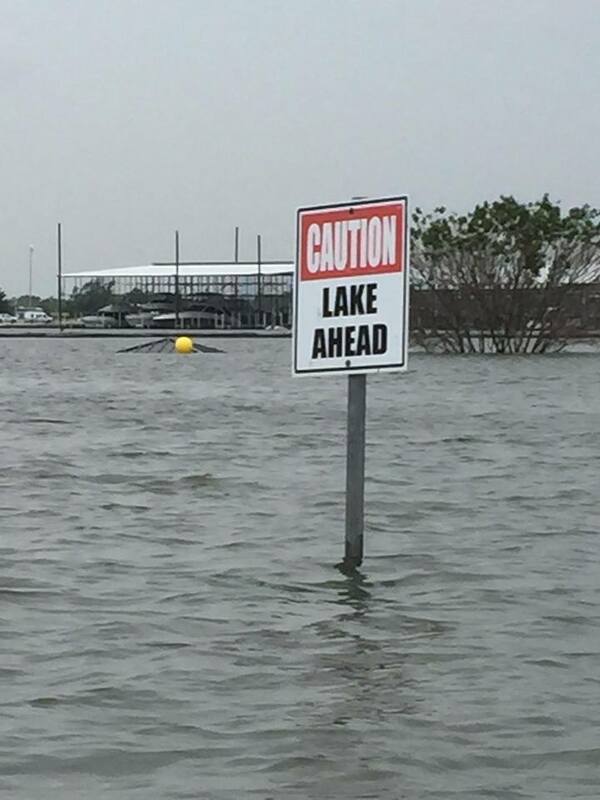 As of May 28, Lewisville Lake was 12 feet above the conservation pool, with 6,606 cubic feet of water being released per second. The city has taken steps to prepare for potentially worsening conditions by releasing lake-flooding information and high-water preparedness data. The Shoreline Trail and The Tribute Nature Trail were the first to close in early May after high water from the lake washed out several portions of the trails. They will remain closed until further notice. Once the water recedes, crews will begin clean-up and repair work on the geo-webbing where needed and replace the decomposed granite that has washed away. But for now, some of the worst-affected parts of the trails are completely inaccessible. As the water levels on the lake continued to rise, both from additional heavy rain and upstream flood control, the decision was first made to close Stewart Creek Park at 8 p.m. nightly. Swimming, wading, and overnight camping were also prohibited due to safety issues. While the hope was to keep the boat ramp and park itself open, it was ultimately determined that a full closure of the park was warranted. High water levels increase the amount of underwater debris and hazards, which includes some of the shoreline structures such as grills and picnic tables, creating serious safety concerns. While the city regrets having to close the park, it was a necessary step to safeguard the public. Jim Mackin, the Parks Department’s Greenscapes and Special Projects crew leader, said the city took steps in advance of the rising waters to protect property and prevent accidents by removing trash cans from their bases along the trails and at Stewart Creek Park, and by attaching buoys to some structures such as park benches and pavilions. “That was in case the water comes way, way up, so curious boaters who somehow get into the lake won’t run into them,” he said. A buoy attached to a pavilion floats in the distance. Back in the city, the weather has kept emergency services personnel extremely busy. One of the Police Department’s main challenges during severe storms is answering the phones in the Communications Center. “The call center can quickly get overwhelmed with all the calls regarding warning sirens, reports of traffic lights out and automobile accidents,” Police Chief David Coulon said. And the weather need not be severe for issues to arise. Heavy rains typically result in a greater volume of car accidents. Coulon reminds residents that speed limit signs are meant to convey the maximum safe speed in the best conditions. The Police Department also asks residents to observe the closures of parks and trails. Ignoring closures makes you subject to arrest or citation for criminal trespassing. But more importantly, they don’t want you running into migrating wildlife or getting injured in areas the Parks Department has deemed unsafe. For the Fire Department, a big concern during severe weather is maintaining points of access. “Flash flooding obviously can occur very quickly, so we need to pre-plan for the best way to access an affected area in the event of an emergency,” Fire Chief Scott Thompson said. To date, accidents and alarm investigations have been TCFD’s only weather-related calls. Thompson said the department has consistently followed recognized policy for handling severe weather but based on recent events and feedback from residents, the city has revised its policy on severe weather notifications to hopefully better meet the expectations of its citizens. “Chief Coulon and I recently visited the Emergency Operations Center (EOC) to ensure the city’s storm sirens were ready for activation if needed, and we have fully revised all EOC documents to address the threats that we believe may impact the city,” Thompson added. TCFD does not have a swift water rescue team but it does have mutual-aid agreements with fire departments that do have such teams. The rainy weather has also created numerous non-emergency issues that the city is working to address. For example, lids on some water meter boxes are raising up and washing away, Customer Services Director Molly Owczar said. Owczar said her staff has also been receiving several calls from residents concerned about standing water and the possibility of a mosquito infestation. 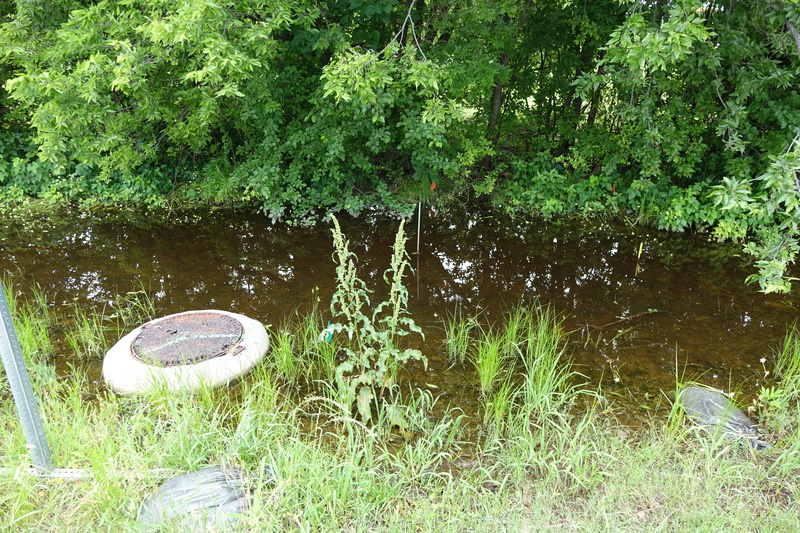 Heavy rains will, of course, generate more standing water but typically only produce nuisance mosquitoes, Mackin said, not the kind that potentially carry diseases. Mackin is one of the city’s licensed chemical applicators. As he surveys city property, he looks for standing water that might breed mosquitoes and treats them accordingly with mosquito dunks. This ditch along East Lake Highlands Drive is typical of the water that accumulates during heavy rains. Parks staff treat these pools with mosquito dunks. Rough-cut areas comprise land the city is responsible for maintaining outside defined parkland. There are more than 250 acres of rough-cut land and ditches throughout the city. Mackin’s crew is responsible for mowing it all. Typically it takes them about 17 straight work days to get through all 250 acres, but with the recent rains they have not been able to mow any of it. Wet conditions prevent Parks staff from mowing rough-cut areas such as this one near Griffin Middle School. At a time like this, every department in the city is working together. For example, Parks, Public Works, and Water department vehicles traveling the city watch for downed trees and branches on the roads and in the medians. Mackin is just one of many dedicated employees doing his part to help The Colony weather the storm. From fire ants to tornado warnings, the city works as a team and in concert with regional authorities to stay informed and prepared. Amid all the severe weather notices were numerous cancellations of city events, either because of soggy outdoor conditions or outright rain. All three installments of the Jammin’ in the Park series were rained out (although a new concert was added for June 12). Movies in the Park, a Drive-In Movie event, and the library’s Memorial Day event at Bridges Cemetery were also cancelled. The Sunset Concert Series scheduled for June 19 at Stewart Creek Park has already been cancelled as lake levels are expected to remain high through the next few months. Director of Communications and Tourism Diane Baxter said city staff members put a lot of work into hosting special events, particularly those that involve utilizing the city’s outdoor stage, but the safety of employees and attendees comes first.